Few days ago, Governor Samuel Ortom while on Channels Television's programme, ROADMAP 2019, disclosed that his administration has sank 800 boreholes. Instead of members of the main opposition party, Peoples Democratic Party, PDP, to commend Governor Ortom for paying the counterpart fund to development partners which led to the execution of the water projects, they have spent time, energy and data trying to play down Governor Ortom's achievement. The reaction of the opposition is not strange to some of us, it will be recalled that the opposition claimed they sank 351 and 400 boreholes respectively in Oju and Konshisha before the left office in 2015. The Transition Committee found out that those boreholes were not in existence. So they feel its business as usual. It is on record that, Governor Ortom through The Benue State Rural Water Supply and Sanitation Agency, BERWASSA, and the Millennium Development Goals,MDGs has executed over 800 water projects. BERWASSA, under the leadership of Engineer Ejembi Ella,has executed these projects in partnership between the state government, the Department for International Development, DFID, and the United Nations Childrens Fund, UNICEF, under the Sanitation, Hygiene and Water in Nigeria, SHAWN, project in eight local governments in the state. 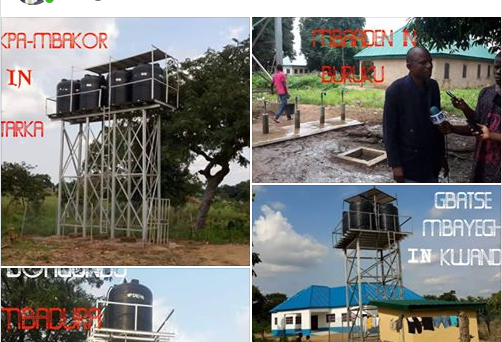 They include: Ogbadigbo, Obi, Oju, Tarka, Buruku, Guma, Konshisha and Katsina-Ala.
Out of the 800 boreholes , some are motorized boreholes, while others are hand pumps, while 344 boreholes have been repaired across the state. Anyone in doubt can go to Mbajir-Asukunya, Unzugh, Yazema, Akpa-Mbakor, Tse Ikywa-Shitile, and Mbaazohomon all in Tarka LGA, Gube, Usar , Nanev Council ward and Boagundu, Mbadura council ward in Kwande, Akpagher-Mbatiav, Gboko, Mbaapen in Buruku, Umuarachi community in Ai-oodo Ward 1 in Ogbadigbo, Zor, Kyan, Vandeikya LGA, Gbengor, Tyuluv in Ukum LGA, Umogidi, Adoka/Ugboju, Otukpo LGA, Owori- Obutu, Okpokpo, Oju LGA, Agbo-Gyahudu, Sengev/Yengev, Gwer West LGA, Abaji in Katsina-Ala, Gbatse, Mbayegh, in Ushongo LGA and a host of others. As disclosed by the former Permanent Secretary in the Ministry of Water Resources and Environment, Mr. Agbogbo Ode, during the 2017 Accountability Press Briefing at the NUJ House Makurdi , the Samuel Ortom administration spent over N1. 4 billion on water projects in the state in the first two years, out of which N900 million was spent on payment to the contractor for the resumption of water supply in Otukpo and Katsina-Ala. It is also worthy of note to mention that, some of the communities benefiting from the boreholes were drinking water from ponds. Today, they now use water from the boreholes for bathing, cooking, drinking and even for irrigation purpose. Attached is a video during the supervision of some of the boreholes by the General Manager of BERWASSA, Engr. Ejembi Ella, the Special Adviser on Media and ICT, Mr Tahav Agerzua.